Chances are you’ve heard of Bank of America, especially considering there’s probably one every other block in any major city in the US. As the 11th biggest public company in the world, raking in over $80bn in 2015, it’s no surprise that Bank of America finds itself as one of the most attractive companies. Keep reading for our in-depth analysis on Bank of America and how you can be one of the lucky few to score a job at one of the most well-established firms in the country. If you’re applying in the US, applications for full-time and summer internships open on August 15th, with positions filling up on a rolling basis. The recruiting process then can extend anywhere from September up until March, with both internships and full-time employees starting in June. Internships typically last 10 weeks, no matter what function you’re in. Bank of America doesn’t publicize how many interns and incoming analysts they have in their yearly classes, but for comparison, Goldman Sachs, a similarly sized firm hires about 350 interns a year. About 50% of interns say they applied for an internship position through on-campus recruiting at their universities, while only 28% applied directly through the Bank of America website. Looking for a job at Bank of America after you graduate? Well the firm says that “the summer internship class is our primary source of hiring into our full time programs,” meaning that if you’re really interested in working at Bank of America, your best bet is to start looking into applying when you’re a sophomore or a junior. If you’re still an undergraduate and trying to decide what company is really best for you without committing to an entire summer there, Bank of America also offers an insight program, where you get invited to specific programming and events in order to develop some new skills while also learning more about the opportunities available at the company. Like at most banking firms, pay at Bank of America is certainly competitive, with entry-level analyst salaries ranging from $70-80k/year. 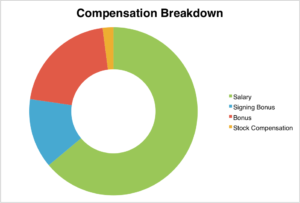 But as you can see below, base salary is not the only thing to take into account when it comes to compensation, in fact it could only make up 60% of your salary. Signing bonuses and yearly bonuses can be hefty, some as large as $50,000, so you can be sure that even though you’ll be working long and hard hours, you will be more than adequately compensated. Bank of America has proven its commitment to gender and diversity inclusion, and has been named one of Working Mother’s 100 Best Companies for Women as well as one of the Best Companies for Women’s Advancement. 6 out of its 15-member executive management team are women, which is the highest proportion among the 10 biggest financial institutions in the US. Women aren’t the only ones to benefit though. Bank of America has also been ranked as one of the Best 50 Companies for New Dads, and though you may not be thinking about starting a family just yet, it’s important to keep this in mind for the future. Bank of America is revered for having one of the most progressive, gender-neutral parental leave programs in the finance world. Both men and women will be allowed up to 16 weeks of paid leave, which can be taken any time during the first year of the new child’s arrival. In terms of schedule, as part of the intern guidelines, interns are not expected to work past midnight or to arrive before 9am, nor are they expected to work on weekend. If you’re a first or second-year analyst, you’re required to take off at least 4 days/month, and you must take off all of your allotted vacation days. Work volume and schedules are heavily monitored by chief resource officers to ensure employees don’t burn out. Fair warning, some of these regulations were implemented after a Bank of America intern in London was found dead after working a 72 hour shift, so while the firm is trying to implement new policies to combat overworking, there still are some problems with work/life balance culture.